Tween Tuesday is a weekly meme hosted here at GreenBeanTeenQueen to highlight great reads for tweens. There's a fantastic middle grade author blog called From the Mixed Up Files....of Middle Grade Authors. This month, the authors are taking off on a Skype Tour Contest. It's such a fantastic idea, I had to share all the details!! A group of noted middle-grade authors hits the virtual highway this month as the huge Mixed-Up Middle-Grade Skype Tour begins cruising through cyberspace. Destination… maybe a town near you! Every month for the next year, classrooms, book clubs and groups will have the chance to win a free, 45-minute Skype visit with a noted middle-grade author simply by entering at From the Mixed-Up Files…of Middle-Grade Authors, a group blog of middle-grade writers. “As far as we know there’s never been another SKYPE tour with so many authors, so many potential destinations, and so many WINNERS!” says tour organizer Tami Lewis Brown. 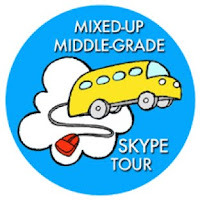 The contest works like this: each season a group of five or more authors will set off in the Mixed-Up Middle-Grade Skype Tour Bus. You’ll have about a month to enter your class, club, or group to win a Skype visit from one of that season’s authors, along with a copy of their book, and more. For every retweet and/or Facebook reposting, you’ll get another entry. To increase your class or group’s chances, invite other adults- parents, teachers, or group members to leave comments at http://www.fromthemixedupfiles.com/2011/04/catch-the-bus-win-an-author-visit/. Each entry must be made in a separate comment. At the end of the month, a winner will be drawn for each Skype author visit. You’ll have six months from that date to schedule and conduct the visit. Authors and winners are paired randomly--you don’t enter to win a visit from a particular author. The winning entry will also receive a copy of the author’s book. The first group of authors to hit the virtual highway will be: Sydney Salter (JUNGLE CROSSING), Bobbie Pyron (A DOG’S WAY HOME), Tom Angleberger (THE STRANGE CASE OF ORIGAMI YODA), Kate Messner (SUGAR AND ICE), Beverly Patt (BEST FRIENDS, FOREVER) and Hillary Homzie (THE HOT LIST). Entries open on the blog on April 6. Later drawings will feature the fabulous: Kathy Erskine (MOCKINGBIRD), Tricia Springstubb (WHAT HAPPENED ON FOX STREET), Sarah Aronson (BEYOND LUCKY), Uma Krishnaswami (THE GRAND PLAN TO FIX EVERYTHING), Jennifer Nielsen (ELLIOTT AND THE GOBLIN WAR), Erin Moulton (FLUTTER), Rosanne Parry (SECOND FIDDLE), Tami Lewis Brown (THE MAP OF ME), Wendy Shang (THE GREAT WALL OF LUCY WU), Kimberly Little (THE HEALING SPELL), Sheela Chari (VANISHED), Sayantani DasGupta (THE DEMON SLAYERS AND OTHER STORIES), Katherine Schlick Noe (SOMETHING TO HOLD), and Jen Blom (POSSUM SUMMER). The tour is sponsored by the From the Mixed-Up Files...of Middle-Grade Authors, a group blog of middle-grade authors celebrating books for middle-grade readers. For anyone with a passion for children’s literature—teachers, librarians, parents, kids, writers, industry professionals— the blog offers regularly updated book lists organized by unique categories, author interviews, market news, and a behind-the-scenes look at the making of a children's book from writing to publishing to promoting. Thanks so much for posting this. It should be a great opportunity for libraries, schools and reading clubs! Squee! This is going to be a great road trip!